Jump start the festive season with great deals on small business shopping. 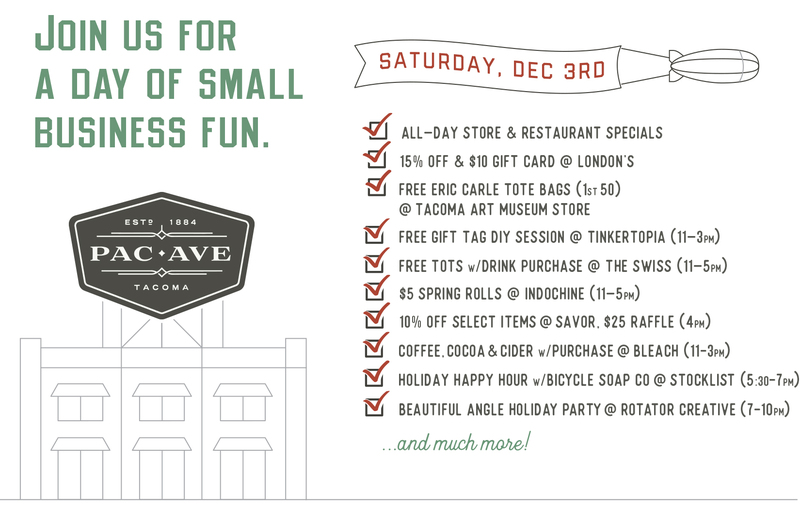 The Holiday Haul Crawl, produced in collaboration of many businesses in Tacoma’s Museum District, is your opportunity to check a few gifts off your list and make merry December 3rd, 10am – 10pm. The idea for the Holiday Haul Crawl originated as Susan Massey from TAM‘s museum store and Liz Van Dyke, owner of Stocklist, were talking about how their stores could best support each other and the rest of the retail, restaurant and museums along their stretch of Pac Ave.
After meeting at Stocklist, they decided to see what their neighbors thought about the idea of hosting a holiday event. The feedback was resoundingly positive and the event snowballed to showcase the myriad of fantastic small businesses along Pac Ave, inviting visitors to the area to tackle a great deal of their holiday shopping in one joyous place! Ben Mauk, Real Estate Manager for the University of Washington Tacoma, was excited about the idea and enlisted the design skills of new tenant, Rotator Creative, to design beautiful, promotional postcard. Tinkertopia owners too were delighted to join the fun, offering the shoppers a free, DIY gift tag and greeting card station to deck out new purchases. Save This Deal Guide to your phone so you can find great gifts and food specials throughout the day on December 3rd. The festivities will go all day and will wrap up with the annual Beautiful Angle Holiday Party. Join event on Facebook. Meet the artists behind the gifts! Have some treats and find some great goods & gifts! Hosting a free gift tag and greeting card making DIY station in the front of the store to embellish all your newly purchased gifts! Cutters Point Coffee will at Bleach from 11am to 3pm serving hot cocoa, hot cider & coffee + gift with purchase. Brittney with set up her LuLaRoe Pop-Up outside the salon! Happy Hour pricing on all appetizers all day! Enjoy 15% off and a $10 gift card for every customer! Giving away Eric Carle Tote Bags to the first 50 visitors. 10% discount on all food & beverage items (excluding alcohol) for the entire day! They will also have a drawing for a $25.00 Gift Certificate. They will draw the lucky name at 4:00PM. Participants do not need to be present to win! Order any beverage and you will receive a side of Cajun Tots for Free. Free UW University Book Store tote with $25 purchase. They will have some of the board games they have for sale open and you can play in their seating area!